Olympic Park. The name sounds like a park that was going to test the limits of my physical fitness. In my mind I saw hundreds of Korean athletes working out, doing backflips and handchopping bricks with their foreheads. If you know how to handchop bricks with your forehead, you are awesome! But, the name shouldn't throw people off. It is a park with an Olympic training facility built there but it is a park for the public as well. 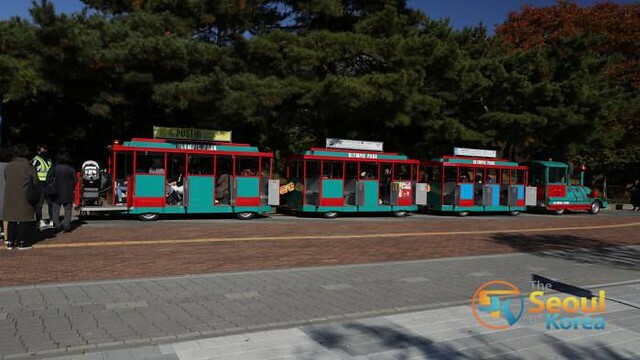 The park has gotten recognition because of Korean variety TV shows like the "Running Man." 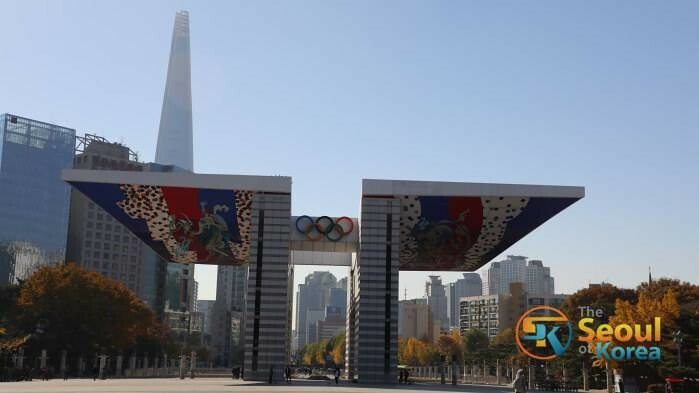 Because a few of the "Running Man" episodes were filmed on location at the Olympic Park, I wanted to visit this place and see what it was about. It is a typical park and much more than that. Parks in South Korea are places where you can go to have picnics, walk, gather socially, and just have fun. I was at Olympic Park years ago, and it seemed like a great idea to visit it and see how it has changed. I was on vacation, so what the heck? It looked peaceful and scenic from the pictures I saw. So, I drove "Fire Wall" over there. One thing I noticed is that the parking spaces were in limited quantities. One thing I learned is that public transportation in Korea is the best way to get from place to place. Luckily, I managed to find a parking spot, parked and got out. I took out my big guns, the Canon EOS 5D Mark IV, zoom lens 25 mm - 105 mm, tripod, lens filters, and my 60 mm prime lens attached to the camera and 15 mm prime lens secured to my lens fast change adapter. I put on my backpack and went walking. I didn't take my slider gimbal, heavier tripod and UAV, decisions I'm glad I didn't decide to do. Immediately, I began to see lots of shots that I could take. I started taking pictures using my zoom lens, the "workhorse" lens. People were passing by, looking at me taking pictures. I saw a few people with Canon DSLR lens, I didn't see what type of camera they had, but they had a camera rig similar to mine. They all had the same idea as me, taking as many good photos as possible. I was walking with over $7,000 worth of camera rig and DSLR camera on me. But I wasn't too worried about getting robbed in South Korea, in broad daylight, in a public park. The park was unknown territory for me because this was my first time actually walking throughout the park. I saw a lot of Korean people walking around the park. I saw that the park was a trendy place for the locals. From kids, young adults, adults, to elderly, they were there walking, having a picnic, taking pictures, exercising, etc. I liked the scenic natural environment of the park. 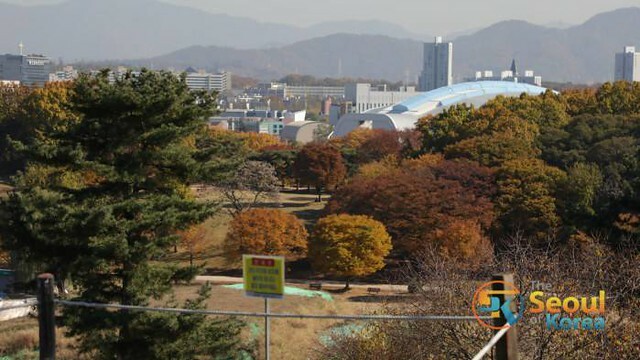 Just outside, hundreds of meters away were the boundary that separates the park from the metropolitan city of Seoul. I saw glimpses of the city and Lotte World Tower available from high vantage points, through trees, and high hills on the park. I began taking pictures. Perhaps, postcard material? I walked the park, but not the whole park. This is where I was glad that I didn't bring all my camera gear. Too much to carry for one person. Numerous routes could be taken, whether by biking, skating, walking, jogging. I don't know how much of the park I walked, but I don't think I scratched the surface. I walked back to where I parked my car, by walking around the interior of the park with the view of the small lake in the center of the park. There is an area of the park that has the nations flags. It is the main entrance into the park. It was very close to the parking area. That area has a modern feel to it, with stores built along the edges of the leading wide area entrance. I also saw a mini train tour, lots of mothers and children were getting on it. I didn't get on that, it looked like I could walk just as fast as the mini train. I took pictures of it instead. The Olympic Park is not just a scenic natural park where people have picnics, play, walk, jog, take pictures or sit and watch the world go by. It is not just a place to eat, take tours, and enjoy the environment. The park also has numerous activities like soccer, handball, gymnasium. The Korean Olympic Committee has their building there and as well as their Olympic training facility. Olympic Park serves multiple functions, the only thing I didn't see was a shopping mall and movie theater. Who needs that when Lotte World Tower is visible, and you can go there for shopping and other entertainment? Become a member of The S.o.K. Nation! Subscribe To Our Website And Youtube Channel. It's Free, Batteries and Kim Chi Not Included! Get Access To Our Giveaways, And Latest Videos And News. It is you that keeps us motivated to stay up late through the night burning the candles and writing. This was “Olympic Park Seoul Korea Travel Guide", written by Gyopo "TactiCool Reloaded" Oppa. Sarang Haey Yo! See You Next Time! Fighting!